If you follow me on Instagram or Snapchat you’ve seen that it’s beginning to look a lot like Christmas in our home! Putting up Christmas is something I look forward to every year but it’s SO much work, so I decided that we need it up longer than just a few weeks in December to really appreciate it. ;) So today I thought I’d share a holiday inspired look with you all today! This J.Crew sweater is 25% off using code SHOPNOW and this Free People scarf is under $50 (and available in more colors!!). These picks are getting me excited about the holidays! I love that turtleneck sweater! Obsessed with this sweater, perfect look for picking out your Christmas tree! I’m so excited to see all your decor together, I love how you have two trees this year. Great idea! I’m so in love with these picks, especially that cosy white sweater with the boots! And I loved seeing your gorgeous trees on Snapchat! They are a fun twist to rain boots! I need those boots in m life! Yes it’s nice to have it up longer since it can be a lot of work to get everything set up. I will take lots of pictures! You can count on that! I love these rainboots they are so cute! This whole outfit is gorgeous! I love all of the items, but especially that sweater! Pretty! Love the outfit inspiration you put up! I really need that white sweater!! I agree with you–I always like Christmas decorations to stay up a while! I love me a pair of simple earrings! I need this entire outfit. Love it all! Can’t wait to see more of your Christmas decorations on Instagram and Snapchat! 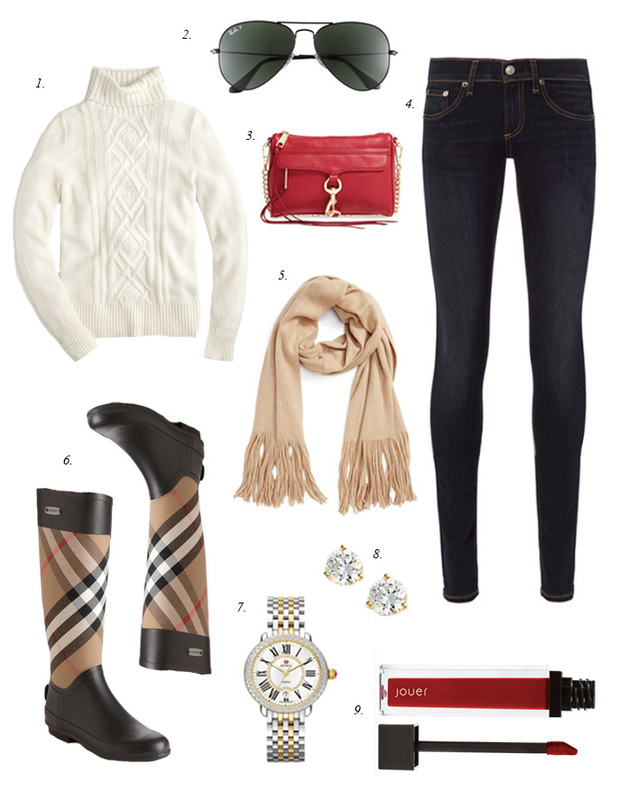 I absolutely love the white sweater, red purse and earrings! Such great pics! I am thinking about putting up our Christmas tree earlier too to enjoy longer because it indeed takes a lot of work and time! Love the motivation I am getting from you! Gorgeous picks! I love the festive theme! Love these picks, so perfect for the holidays! I’m so ready for all the holiday clothes and styles! I’m loving that red bag; I should probably invest in one like it for the holiday season. Love it all! Can’t wait to get back into my Winter clothes! I NEEEED those burberry boots in my LIFE though! That sweater and those boots are so perfect for fall!